It’s Shouter Baptist day here in Trinidad. Have been away from Ja since the 22nd, first in Barbados where i attended a work retreat and conference at UWI–but more on that later; since i was so close to TnT (Trinidad and Tobago) i decided to hop across for a few days to feed my ‘doubles’ fix and check in with close friends and collaborators whom i haven’t seen in a while. Ataklan and his friend Rabbit picked me up at the airport and of course first stop: doubles vendor at Long Circular Mall. That evening i caught up with Christopher Cozier, an artist whom i’ve frequently collaborated with, over a bottle of wine. I’ve written about his artworks in the past and we work together closely on the art aspect of Small Axe and other projects. The last two years have found each of us so busy that this was the first time in a couple of years that i was able to show him the various visual works coming out of Jamaica recently that i find exciting. One of these is an eloquent, trenchant commentary on the situation in Zimbabwe by young Jamaican artist, Michael ‘Flyn’ Eliott. Flyn who recently recieved a lot of flack from the powers-that-be of the Jamaican artscene, has proved with this painting that he is capable of the kind of imaginative leaps that his customary photorealism often left one craving for. 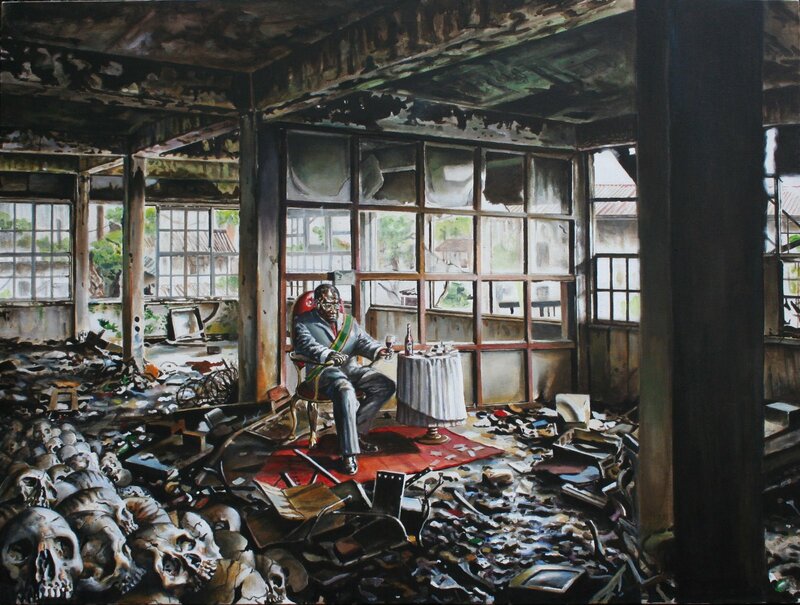 Titled ‘The Trillionaire’ the painting depicts a self-absorbed and abstracted Mugabe sitting amidst the ruins and debris of a burnt out building. He is seated on a patch of red velvet, drinking wine and surrounded by piles of Zimbabwe dollars. On the left is a heap of bleached out skulls. The painting is testament to the power of an image to convey what a trillion words could not. What had motivated such a departure from his usual subject matter i asked young Flyn. Well, said he, he had been in Suriname recently, visiting fellow graduates of the Edna Manley College of Visual Arts there and had come across the ruined building. While photographing it, the image of Mugabe sitting in the ruined interior suddenly came to him. Normally he would have simply reproduced the interior, brick by brick, in loving detail, but this time something had clearly jostled his imagination. Whatever the reason, i thought the resulting painting was an exciting departure and leap forward for Eliott. Chris found ‘The Trillionaire’ intriguing, particularly when i mentioned that it was inspired by Eliott’s recent Suriname trip. Hmmmm, said he, it seems to be dealing with the theme of genocide. The painting reminde him of the work of Surinamese artists such as Marcel Pinas. Pinas graduated from the Edna Manley School of Visual Art (located in Kingston, Jamaica) in 1999 at the top of his class. Cozier pulled up a Pinas image called ‘Wakaman’ from a recent exhibit of his to show me what he was getting at (As Usha Marhe informed me Wakaman is a Sranantongo (Surinamese lingua) word literally meaning ‘walking man’. It expresses somebody who has cut himself loose from everything and everybody, going here and going there, with no obligations). The work, part of an installation, clearly hinted at what might have nudged Eliott’s imagination and provoked the devastating image of Mugabe he subsequently produced. Pinas’s work often references the destruction of the N’dyuka culture in Suriname. The N’dyuka is the Maroon community Pinas was born into, whose way of life is gradually vanishing. 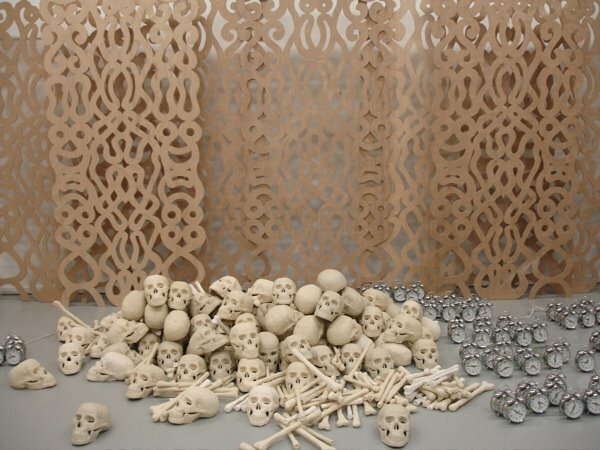 How interesting, i thought to myself, listening to Chris Cozier and noting the pile of skulls in Pinas’s installation. This is why it’s important for collaborations to take place in every sphere–between critics and commentators, between artists, between thinkers– in different parts of the Caribbean and elsewhere. For cultural criticism is partly detective work and you can’t read all the clues sitting marooned on an island. Eliott’s recent work also demonstrates the invaluable element that traveling outside one’s culture and linking with other artists in other places can contribute to an artist’s practice. 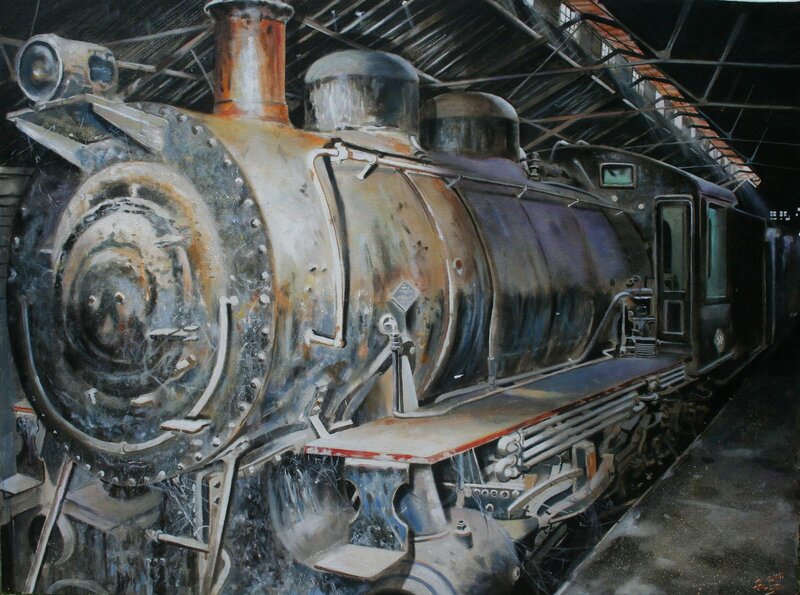 As elegiac and moving as some of Eliott’s work has been in the past–for he is also lamenting the passing of a way of life, just look at the painting he recently produced of the last steam engine used in Jamaica, Phantom 54 (top of this post)–there is no question that his Suriname visit has made this talented Jamaican painter grow in ways that could not have been foretold. Amen! More importantly, Michael Eliott allowed himself to be open to that growth, without trying to predict or manage from what direction and in what form it would come, or pin it to the whinings about the “art market”. Both of those are powerful works. I find the imagery in ‘Wakaman’ even more disturbing in its simplicity than the imagery of ‘The Trillionaire’. Yes, Frag but The Trillionaire would speak to a wider audience…in the way that only paintings can. its direct and clearly refers to a specific situation we’re all aware of. it’s speaking in a language that’s easily understood.Wakaman is really beautiful…and evocative but unless you can read the symbols it’s non-specific though no less powerful for that. Next Next post: Piracy: the way the books are balanced?